Synthetic peptide from the N-terminus of Human IARS2 (SwissProt Q9NSE4). Human small intestine tissue, RAW264.7 and COS7 cell extracts, HepG2 cells. Note: PBS without Mg2+ or Ca2+. Our Abpromise guarantee covers the use of ab166870 in the following tested applications. WB 1/500 - 1/1000. Predicted molecular weight: 114 kDa. 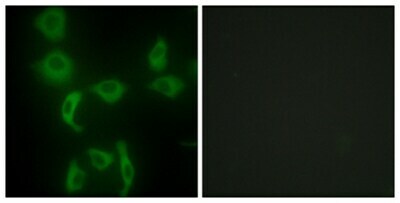 Immunofluorescent analysis of HepG2 cells, labeling IARS2 with ab166870 at 1/100 dilution. 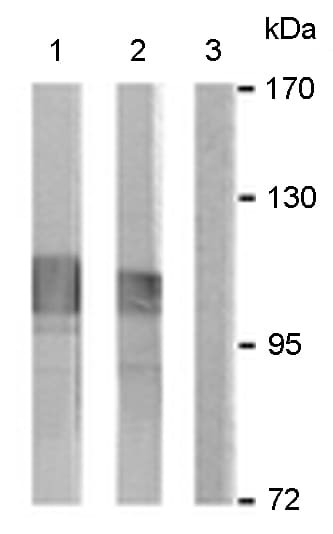 The image on the right shows cells treated with the synthesized peptide. ab166870 has not yet been referenced specifically in any publications. Publishing research using ab166870? Please let us know so that we can cite the reference in this datasheet. There are currently no Customer reviews or Questions for ab166870.